Where Did Where Do They Go? Come From? Some books you will yourself to write, some have their own wills and come through you, insisting on being written. A few years ago, I began losing many of the people I love. One of the difficult things about coming from a culture where your extended familia is considered your "nuclear" family is that you don't just lose a set of parents, a couple of aunts and uncles, but dozens upon dozens of tías, tíos, madrinas, padrinos, abuelitas, abuelitos. A whole flank of familia is suddenly gone. My parents joined that clan exodus, dying within five months of each other. Actually, I had been losing both incrementally to Alzheimer's over several years. Each time I returned to the Dominican Republic to look after their care and visit with them, I'd braced myself for the day when they wouldn't know who I was. No matter how old you get, while your parents are living, you are still somebody's "child." Their loss, though painful, was in the natural order of things. But then came a loss I was not expecting: my older sister committed suicide. I felt as if I'd been sliced open, and my guts poured out of me. Life, or the desire for it, was leaving me. Part of us dies with the death of people we love. All we can do is wait and see what is left when our grief is done with us—if it ever totally is. In this state, I didn't have the patience to read. Novels suddenly seemed overwhelming, full of noise, words, characters put through so many needless complications. Oh spare them, spare them! Life was hard enough. Only poetry—certain poetry—(and short poetic novels) seemed to reach me, the older and more traveled down the generations the better. I must have read every translation of Gilgamesh, the oldest surviving work of literature; Homeric Hymn to Demeter; I read and reread Rilke's "Orpheus, Eurydice, Hermes," T.S. Eliot's Four Quartets; David Ferry's Bewilderment. Poems with gravitas, with the grave in sight, the stone briefly rolled away from the mouth of the poet. I wish I could report profound philosophical insights in response to these texts. But all I could manage were the simplest childlike questions. What do I do now? Where do I find the people I've lost, the qualities they embodied, the energy they brought into the world? How do I not let who they were die out completely? Question after question, and if anyone tried to answer them, I felt even more isolated and sunk in my grief. than to be named Pablo Neruda? where then does the sea get its salt? How many churches are there in heaven? Where is the child I was? Still in me or has he gone? as soon as they stop being poor? As with the written word, so also with visual art. Only the work of certain painters seemed to accompany me. Goya's Black Paintings were my visual Gilgamesh—their grimness, their darkness, the story that went with them—how in his increasing deafness and fear of madness, Goya painted the walls of his solitary villa. I pored over them online and in art books. My favorite was "Dog Drowning." The pitiful pleading head sticking out of the golden quicksand. On one hunt for Goya art books in the Middlebury College Davis library, a series of prints depicting the Demeter-Persephone story by the renowned new England artist, Sabra Field, an alum, caught my eye. Her stark, stripped down images. Their simplicity and beauty and terror. I found myself returning often to visit the Demeter Suite, the terrified daughter kidnapped by the king of the underworld Hades, Demeter punishing the earth with winter, the happy reunion, the wrenching yearly separation. I sought out other work by Sabra Field, and found her profoundly moving series, Pandora Suite. This woman understood grief in a visceral, palpable way. Again, as with Goya, I felt accompanied. One day, one of those childlike questions kept going round in my head. When somebody dies, where do they go? It was late autumn. I was jogging down our deserted country road. I found myself shouting the question in a whole range of emotions from fury to self-indulgence. The chill was in the air, the sky was grey with November clouds, the wind was edged with the chill of the coming winter. When somebody dies, where do they go? When somebody dies, where do they go? When somebody dies, where do they go? Who can I ask? Does anyone know? I couldn't yet muster the ambition, the animo, the whatever-it-takes to write a whole poem. Instead, every time I had a new version of the question, I'd jot it down. There were little pieces of paper strewn throughout the house, scribbles in the margins of grocery lists, indecipherable scrawls on the scrap paper on the bedside table when I woke up in the middle of another sleepless night. Even now, I keep finding little scraps that I didn't include in the final version of the poem, Where Do They Go? Time passed. I finally did sit down and write down the poem/children's book, Where Do They Go? I knew right off the two people I would chose to do the art for the book, and one of them, Goya, was not available. So, I thought: what do I have to lose? (Grief also trumps fear.) I wrote Sabra Field. I told her how her Demeter Suite had accompanied me in my grief. I had no idea if she would entertain such a project or feel it was below her standards to work on a book for children—though I called it a book about death for children of all ages. She instantly responded that she would love to collaborate with me, but she would have to see the text first. So, I sent her a copy of the poem, and she graciously agreed to do the art. The problem now for my guardian agent, Stuart Bernstein, was finding a publisher willing to take on our "package deal." It was Sabra and Julia, or no go. My experience with previous picture books was that the publishers often insist on selecting the illustrator of a manuscript unless the writer is also the illustrator. It's turf they don't easily cede. But then Seven Stories is not the usual kind of publisher, open-minded and big-hearted indie with a social conscience (Earlier in the year I had blurbed a wonderful picture book by the author-illustrator, Innosanto Nagara, A is for Activist.) Seven Stories didn't shut the door on a good idea or a good duo. After viewing Sabra's work online, they were more than happy to publish our collaboration. I also have the good fortune of being a relation (distant cousins) as well as a fan of the Dominican-American poet, Rhina Espaillat. Rhina is not only a wonderful poet, but a first-rate translator. 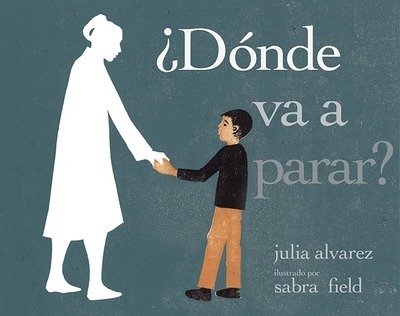 She translated the poem for the Spanish-language edition, ¿Dónde va a parar? 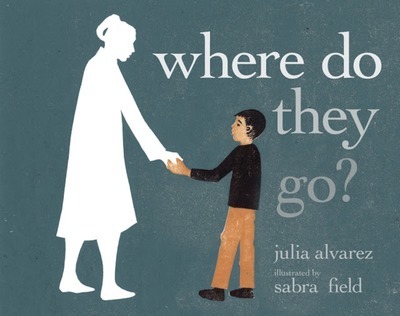 Now that the book is published, I look at Sabra's intriguing cover art, and I feel the ascription should read "as told to Julia Alvarez" by the wind, the rain, the flamingoes, the stars, the bits and pieces of all those I've loved and lost, and who come alive for me as I turn the pages of this book I wrote down to accompany those who grieve.